Since 1978, Tayloe Court Reporting LLC has been providing the highest caliber of court reporting services to clients worldwide. Founded by Certified Court Reporters, we have been the nation’s leader in quality and confidentiality. Litigation today requires a prompt and accurate record and quality work at competitive rates. You can rely on Tayloe’s expertise to provide a consistent, reliable output and superior customer service. With the attention to detail of skilled professionals as well as cutting-edge technology, you can be sure you’re in good hands with Tayloe. For all of our court reporting services, we offer expedited and standard delivery, competitive and accurate pricing, quality and confidential output, experienced Certified Court Reporters, full-sized and condensed transcripts. We have notaries available in Virginia and North Carolina. Our court reporters can arrive at your proceeding and can simultaneously transmit the transcribed deposition to the screen on your computer or mobile device. Text can be viewed and annotated within seconds of the testimony being given. 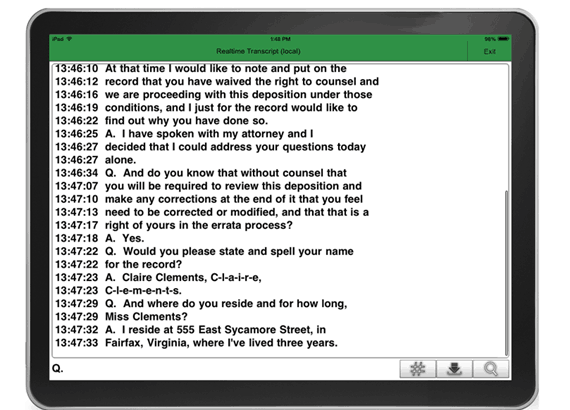 Realtime is a high quality and technologically-innovative court reporting solution that is achieved by connecting a laptop computer to a stenographic machine. This instantaneous translation gives attorneys the cutting edge in representing their clients. In addition to our realtime translation services, your transcribed deposition can also be simultaneously viewed online from any computer, smartphone or tablet with a web browser and internet connection. This allows clients to view the live transcript remotely from anywhere in the world and can connect their webcam to be seen by the witness and attending parties. On computers, this service is completely browser-based and does not require any software to be downloaded. However, a free mobile app is required to view from a tablet or smartphone. Our streaming service can also provide viewing of the transcript text and live video feed simultaneously, secure 12-digit login key for each attendee, built-in invitation management, live exhibit sharing, secure private group chat and toll-free phone conferencing. As the reporter transcribes your deposition, the text can simultaneously be transmitted to your computer screen. Text can be viewed and annotated within seconds of testimony being given. This is achieved by connecting notebook computers directly to the court reporter’s stenographic machine. The application provides case-wide searching of transcripts.